Notes: Designed by Andy Burk. Andy is a Sierran guide with a number of excellent nymph patterns. This one is a favorite. It is simple and effective. Make sure you use Vernille or Ultra Chenille for the abdomen as regular Chenille will loose its fuzz quickly. 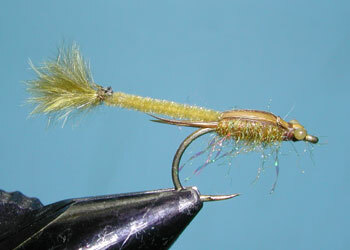 Micro sizes are now available to enable you to tie this pattern in smaller hook sizes. 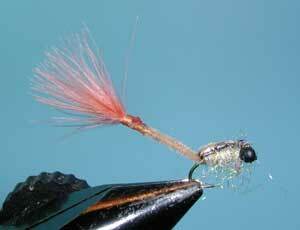 Andy made another variation to this pattern in 2004, which he called his "Sierra Damsel". 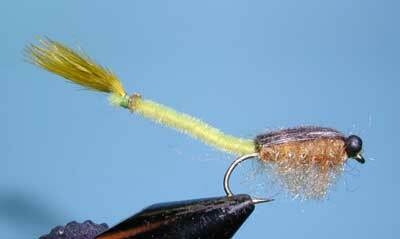 He ties the Sierra Damsel in both Olive and Ginger. The wingcase is a pair of Turkey Biots which are anchored at the base of the thorax with the tips extending halfway along the abdomen. The thorax is Antron Sparkle Dubbing with a pair of Krystal Flash pieces added for legs. This results in a sleeker appearance and gives some attractor flash to the body with the Antron and Krystal legs. The biots are pulled over the back for a wingcase and anchored beneath the mono eyes. The biots are then drawn over the eyes axis to resemble a thoracic segment and trimmed. Using Turkey Biots gives the wingcase much more durability. Note also that Andy is utilizing a larger wide gap nymph hook. This will result in better hook-ups following a quick hook set strike. Damsel nymphs is an important fly choice within the Sierras, especially in June and July. The nymphs are preditors that reside within the weedbeds of lakes . They feed upon other insects and crustaceans. When they are ready to emerge, the nymphs need to migrate to the nearest shoreline or crawl onto anything the emerges from the water. Usually this migration will occur in the morning and late afternoon hours and the trout will key upon them. They have a undulating method of movement, so retrievals should be slow or non-existant but always give the fly some movement. Work the edges of the weed beds. This page is not to be copied without my explicit permission.